This post is part of our Startup Funding Benchmarking Series exploring the allocation, concentration, and macro trends in the financing of high growth startups. Market volatility continues, and the FOMC decision to wait on raising interest rates appears to have brought short-term relief. While many investors say they are in “wait and see” mode, deal-making that was already underway continues and our forecast for Q3 climbed another $100M over the past 2 weeks to $20.5B (for context our initial estimate as of August 31st was $21.6B). 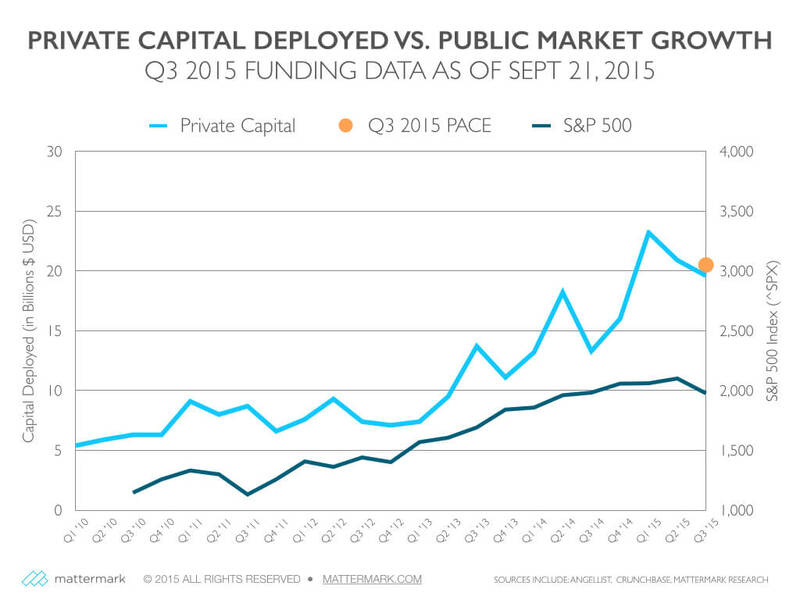 Since our previous update on funding pace on September 8th, we have detected 75 new funding rounds totaling just over $2B for an average of $250M per day in capital deployed to private companies in the United States. Q3 is shaping up to be down just slightly from Q2 total funding numbers, but overall the upward trend continues as deal that were already in the works continue to be announced. Overall, the effects from public market swings are more likely to be seen playing out in the new quarter. Looking for resources to help you research startups and venture capital? Sign up for a free trial of Mattermark Professional to access the underlying data for these graphs, as well as in-depth profiles of more than one million high growth companies.